The doors in your home are used constantly and throughout the day, on a regular basis. It only stands to reason they will need certain repairs, adjustments and maintaining from time to time. Here are some ways to provide greater serviceability. In certain cases, also resulting in energy savings, while enhancing the life of the doors and enabling a more comfortable living environment. Tuning, ways to make the movements to adjust the door once it has already been installed. Describes adjusting sets of bifolds on the vertical and horizontal, as well as resetting loose pivot bolts. Step-by-step that gives the tools needed and the repair sequence for resetting the jamb. Instructions on cutting for a gap correction. Offers price considerations for the front door as a replacement unit in wood, metal and fiberglass including customized shapes and solutions. Gives breakdowns on costs when going with carpenters and doing the installation yourself, including trim & hardware and other details. Covers everything from making adjustments to replacing springs and the major door components. The cost of having garage doors put in based on type and door dimension. Bring a greater functional performance by preserving the slab shape - apply and maintain effective door sealing where needed. The main types of seals and how to apply them onto doors. From foam and felt, to vinyl clad and gasket-style solutions. 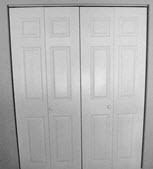 Sealing Door Bottoms to Insulate - at Threshold - ways to insulate against drafts by adjusting, and replacing the bottom seal. Covering threshold inserts and more. How to preserve wood and certain masonite with sealer. Prices for the front door of the house. From adjustments to major components. Based on type of garage door & dimension.